It’s a colorful cloth created through use of dyes and stencil patterns tracing back centuries, to a time when Okinawa was the Ryukyu Kingdom. Bingata is documented back to the 14th century, when Okinawa was engaged in trade with a number of countries. Interestingly, the word bingata didn’t come into play until Iha Fuyu first used it in the late 1800’s. 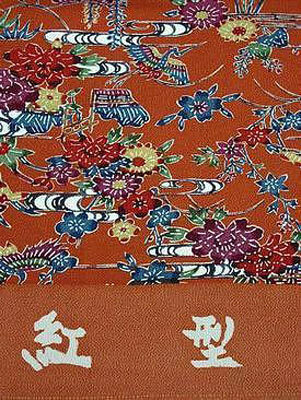 Prior to that, it was called katachichi, meaning “to apply patterns” or hana-nunu, a flower cloth. A dye process specialist in the early 20th century tagged the bingata fabric as “colored designs” because Œbin’ meant colors and Œkata’ meant designs. Bingata has played a colorful role in Okinawa’s history, when‹during the Ryukyuan Dynasty‹dye materials were issued only by the King, with patterns and designs created by a special Drawing and Design Planning Office. Bingata was for royalty, permitted to be worn only by the royal family and select upper echelon women who were authorized a bingata kimono. Each woman had her own private pattern, and law forbad others to use or copy it. The bingata artisans found themselves stymied by World War II, when the devastation on Okinawa wiped out their supplies of stencils, tools and dyes. Prior to that, the bingata shops flourished around Shuri Castle, moving to Naha only after Satsuma invaded the island and forced moves to Naha. As American GI’s occupied Okinawa following the war, materials tossed out by soldiers were recycled as design papers, stencils, dyes and even tools. Bingata artisans found the foreign troops a ready source of cash as the Americans bought souvenirs of all sorts, including bingata postcards. The oldest bingata known to exist today is on Kume Island, where a silk undergarment thought to have been worn by the daugher of a chieftain during the reign of King Sho En in the late 1400’s is on display. Bingata is created through a process thought to have blended Indian, Chinese and Javanese dye processes centuries ago, then tweaked to use available Okinawa materials. Red dyes come from extracts of Okinawa hibiscus, while yellow stems from garcinias. It takes several artisans working together as much as a week to create the design and paint a single kimono, with team members first painting the pattern on the material, then covering it with a protective gel, and finally, the dye process tailored to individual customer preference. of the work involved. As such projects can take a month or more, orders are placed well in advance of the ceremonial occasion for which it is sought.